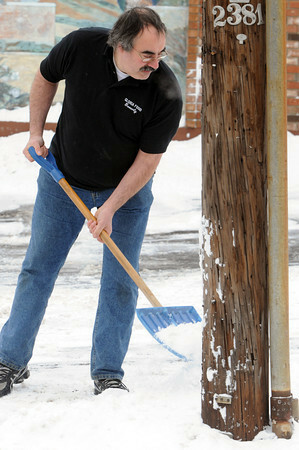 Ken Yuszkus/Staff photo: Beverly: Scott Ofiesh shovels the parking lot at Gloria Foods in a T-shirt despite the severe cold and biting wind on Wednesday morning. He was outside shoveling for a while. The low temperatures and wind will stick around for a few days.